You are among the fortunate few to have been invited to Sketch Framefiller's first major showing. 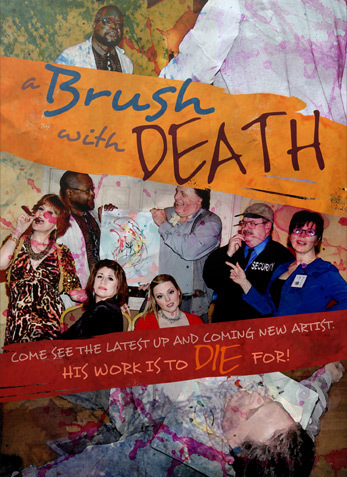 Be sure to meet the charming artist, his wife Franny, and his inspiration, the model Posie Still-Life. Also in attendance this evening is the well-known art critic, Critique Clouseau; local struggling artist, Sherman Williams; and patron of the arts, Pali Patroni. Security has been hired to make sure that no foul play befalls these valuable canvasses or their creator. If you notice a nosy man in rumpled clothing, let's hope it's the security guard, Rosey Guardino. We often think of the art world as sophisticated and highly creative...but have you ever thought that it could also be deadly? What color would you paint jealousy...or greed...or infidelity? Could red play a big part in the mix? Will art imitate life or will the opposite be true? It will be up to you and your table of fellow sleuths to discover who could commit a dastardly crime. So, think of a clever name for your table, er, detective agency and listen carefully for clues. At the designated time, your agency will be asked to formulate a question that your delegated chief will ask a suspect. Once all tables have completed their questioning, each detective agency will submit a solution sheet indicating "who done it" and why. The first agency to name the most correct motive and culprit wins. Tonight's featured artist. He's a newcomer to the art world. Why have we not seen his work before? Is his a latent talent, or is that talent with latex? Do we get the "impression" that things are not as they seem? Will a sketch in time crave crime, or is his career about to be charcoal? Progeny of a long line of house painters, Sherman has taken a different stroke and is trying to make it as an artist. He has always been more interested in creating artistic canvases rather than curb appeal. His talent lies in painting, not business. Is it time he "penned" someone down and inked a deal for himself? Or, is it time he just "easeled" on down the road? Her world seems to revolve around spraying perfume and posing alongside inanimate objects. Is there more to this model than meets the eye? Did she really ride a horse for the painting? Will her life be stilled or will she pose a threat to members of the arts community? Noted art critic and fashion misfit, Critique takes great pride in her position in the arts community. She is a woman of power who will not be easily dethroned. Will she make heads roll, or will she land in the critical care unit somewhere? After all, wouldn't everyone like to kill the critic? Socialite who is a very well known patron of the arts, she is sponsoring tonight's gala. She is pleased that she is the one to discover Sketch. Will we soon discover that she has things to hide? Why is her favorite vacation spot Switzerland? Is the party her opportunity to take care of "problems", or will her affair end unexpectedly? Long-suffering wife of Sketch and mother of their daughter, Canvas. She and Sketch met when she was a model. She has since thrown herself into research. Will she stand by her man, or is it, can she "stand her man?" Will her creations compound her woes, or prove to be a remedy for what ails her? Hired to protect the artist and his art. He may not have an eye for art but he knows how to keep an eye on the art. Be sure to say "hello" and ask him who his favorite TV detectives are. Let's hope that he won't have to use all the wisdom he's gleaned from his heroes.